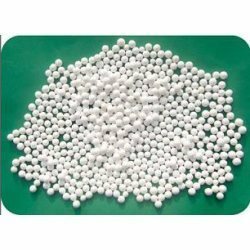 Leading Exporter of activated alumina from Vadodara. The premium quality Activated Alumina offered by us is widely used in a large number of applications. These are based on latest technologies and made using fine quality material. Our customers highly value these for their ability to provide accurate and prompt results. Gases: Acetylene, Air, Ammonia, Argon, CO2, Cl2, Cracked Gas, Ehane, Ethylene, Freon, Furnace Gas, He, H2, HCL, H2S, CH4, N2, O2, Propane, Propylene, SO2 etc. Liquids: Benzene, Butadiene, Butane, Bromine Chloride, Butyl Acetate, Carbon tetra chloride, Chlorobenzenes, Cyclohexane, Ethyl, Hexane, Hydraulic Oils, HF alkylation feed, Jet Fuel, Kerosene, Lubricating Oils, Naphthas, Nitrobenzene, Pipeline products, Hylene, Refrigerants, Vegetables Oils, Transformer Oil etc. With dry gas: 120 Deg. C. - 150 Deg.C. With dry gas: 200 Deg. C. - 250 Deg.C. Adsorption Capacity (at 60 % RH): 21.5 %.